Anyone can workout for an hour, it's controlling what goes on your plate in the other 23 hours that takes real strength! My struggle has, and I think will always be, food. Sweets, treats, goodies all call my name and I have such strong emotional memories around food that it’s hard to keep perspective. I’m an emotional comfort food eater. And Holidays, are one of the hardest times for me. All the candy for Easter and Halloween. All the carbs for Thanksgiving and Christmas. But now I’m working on creating memories of my family and things we did together rather than just the foods we ate. It takes real strength to stick with eating the foods you know you should be eating over the foods that you want to to help you feel better. This is why I drink my daily cravings crushing shake so I have more control to say no to crap foods and set my day and intentions right. The best thing you can do for yourself is to cut the crap food that we tend to eat daily. And limit it to occasionally. 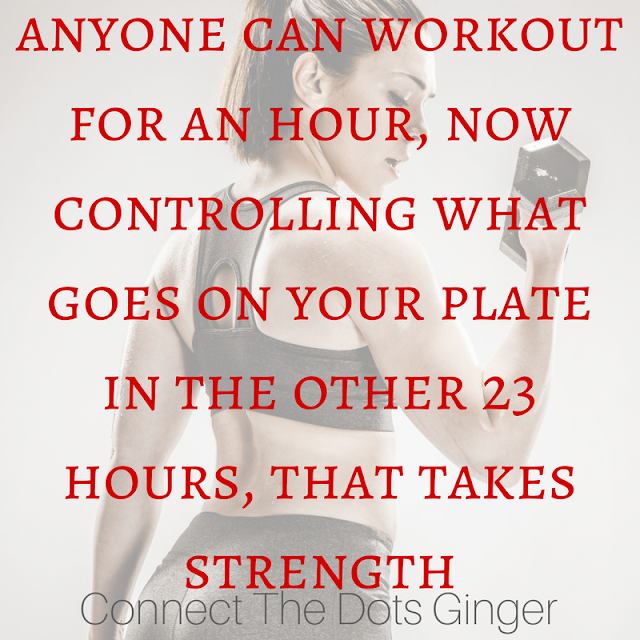 And the rest of the time use that strength you have in you to eat healthy meals that you make yourself and eat the foods that you know you should be eating! Start by making more meals from home and less eating out so you know exactly what you are putting in your body. Stop eating sweets, treats and salty snack foods daily. Save the treats and goodies for Holidays and special occasions only (and don't make every day something special, even though it is! You know what I'm talking about!) Do your best to eat healthy and clean most of the time. Become mindful of the portion sizes you eat. Eat more veggies than carbs on your plate. Drink more water. Most of us do not drink enough water. Make it a goal to drink at least 1/2 your weight in ounces a day. Get enough sleep. Lack of sleep can actually mess with your nutrition and eating habits. Aim for 8 hours of sleep a night. Missing 1 hour a sleep a night for a week is 7 hours a week of sleep that your body needs! Nice!! Health is most important expect which everyone should consider as a first priority. Our health is very precious and we should not waste it. In humans it is the ability of individuals or communities to adapt and self-manage when facing physical, mental, psychological and social changes with environment. So fitness is very important and for that we should always prefer good supplements like hgh supplement.Its totally natural and does not contain any side effects to the body.